Whether it be a food processing facility, a grocery store with specialty foods, a personal chef, or a restaurant with a take away menu, Meal-tray-sealer's are always required in majority of the industries. We, at Shri Vinayak Packaging Machine Pvt. Ltd, are providing the same at a very economical cost that would not burn a hole in your pockets. With a film size of 800mm, this is the most convenient piece of equipment in today's times. Easy to set up and easy to use, this machine has a sealing speed of almost 8-10 seals a minute thus being moisture resistant and allowing the food to remain warm and fresh for long hours. 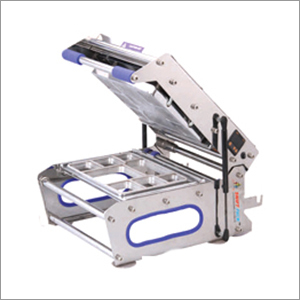 Energy efficient and cost-effective, this tray sealing machine is a handy product which seals trays of various sizes. Any inquiries regarding this would be handled by our team of dedicated employee's who work day in and day out to work towards customer satisfaction.